High elevation above Miquihuana, Tamaulipas. 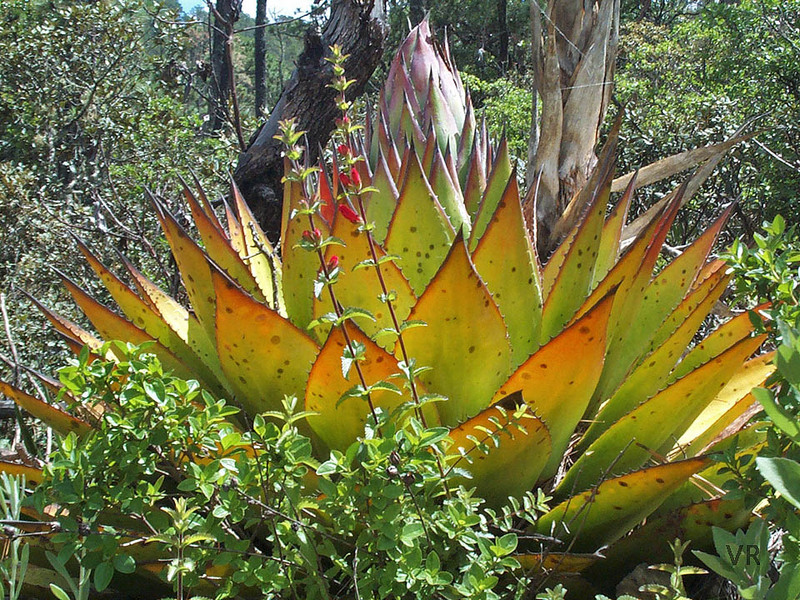 Large agaves are prominent members of the mountain plant community in the mixed forest/scrub transition zone. Many reptile species utilize the protected micro habitats that agaves provide. Most agaves die after completely exhausting themselves in their monumental blooming efforts. Spent, decaying agaves litter the landscape. Their spongy, partially rotted woody tissues absorb the summer rains and provide valuable moist micro habitats protected by rot resistant, thorny armor. The short, rotting trunks provide an excellent, protected medium for reptile eggs. The blooming agave featured above (A. gentryi?) is in its death throes (as indicated by the brightly colored leaves) and arguably at its most beautiful.